On 17 of June, killed journalists VGTRK Anton Voloshin and Igor Korneluk. 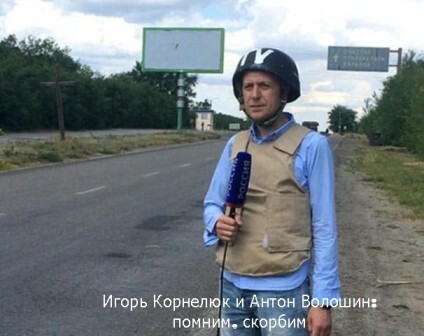 Special correspondent in Ukraine Igor Kornelyuk, video engineer Anton Voloshin and cameraman Viktor Denisov came under mortar fire near Lugansk. All the journalists were with a sign "mass media". The operator Viktor Denisov was not injured, he was at some distance from the main group. Later he identified the bodies of their colleagues. At the time of attack, the militia tried to take the refugees out of the danger zone. Previously holding has confirmed the death of its journalists near Lugansk. This was reported on the official website of the company. President of Ukraine Petro Poroshenko promised to investigate the deaths of journalists and to ensure the safety of all journalists in Ukraine. In a conversation with Vladimir Putin, Poroshenko expressed condolences to the families of killed journalists. Vladimir Putin expressed concern in connection with death of Russian journalists and emphasized the need to ensure security of mass media representatives in Ukraine. The bodies can be handed over to their relatives on Wednesday (18 of June 18). About it reported in a press-TV channel service. However, with confidence on the transfer it is impossible to say because of not stopping the fighting.